I am so EXCITED I received a wonderful surprise in my mailbox. My mailady has really been good to me lately. 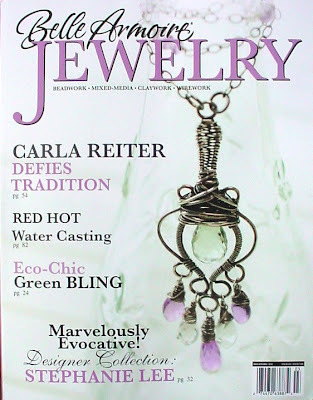 A complimentary issue of Belle Armoire Jewelry.!!! I screamed so loud my DH heard me and he wasn't even home!!! LOL. Its the very FIRST time I have been in Belle Armoire. The fantastic magazine published by Stampington. A few months back I decided to submit a couple of pieces but never dreamed any of it would published. I skimmed through it so fast I missed it the first time around. O.K. Lynn slow down. I found it. Towards the back but yes it was there!! Yeah!!!! They still have a couple more of my pieces who knows maybe another surprise in the future. I Hope so! Be sure and pick up your own issue of this Beautiful magazine. 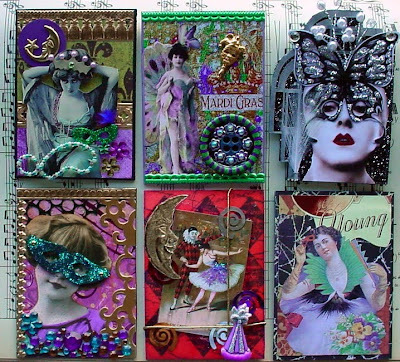 Here are some ATC's from a swap I did with an online group I belong to. I feel so lucky to be a part of there group. Such incredible artists every one of them!!!! The top one is one of mine. Starting from Top left is Kris Dickinson's(also the host of this swap) Teri Chinen, Laura Carson, bottom left Julie Ziemann, April Dudko,Liz DeWitt. Thank you ladies for your incredible Art!! Don't you just Love Lace? The old vintage lace that has just the touch of creamy color to it? 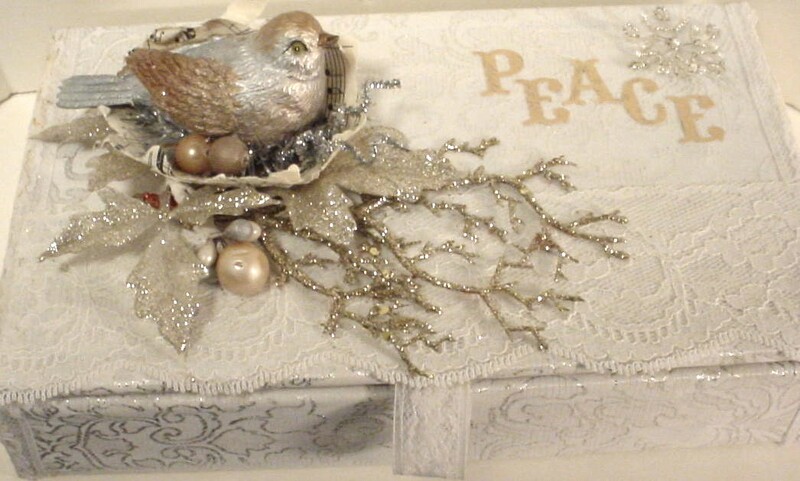 That's what inspired my Lace bird box and gift cards.On Gingersnap Creations you can see lots of beautiful samples using Lace and fibers. For my box I covered an old cigar box with lace paper, vintage lace pieces and torn music sheets to make a little nest for this sweet bird to perch atop. 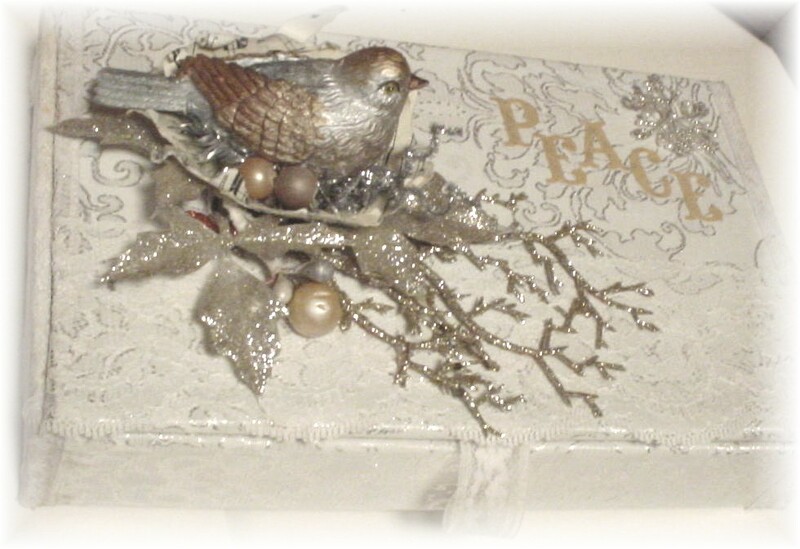 A little glitz with some glitter twigs. 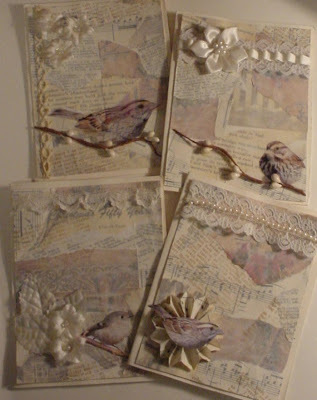 The cards were made using torn papers collaged and some bird images from Retro Cafe Arts. If a couple of these cards look familiar that's because they were published in the Christmas issue of Somerset Studios For info on how to make them check out the Christmas issue! Its finally here. Grab your ticket and Climb on board the magic carpet to share the journey with bloggers all over the world. The One World One Heart Giveaway was started by Lisa from A Whimsical bohemian three years ago as a way for bloggers to connect. I had just started my blog last year so didn't have a chance to join in. Anyone can join in my giveaway. You don't need to have a blog, just make sure you leave a way for me to reach you. The giveaway ends on Feb. 14Th at 12:00 and will close at that time. I will use the random # generator to draw my winners,just make sure you only enter one comment! Others will be disqualified. First # drawn gets first pick, second # drawn gets second pick, etc. To read more about Lisa scroll to the bottom of my page. I will be out of town but will announce the winners of my giveaway by Saturday the 20Th. So here's whats up for grabs. 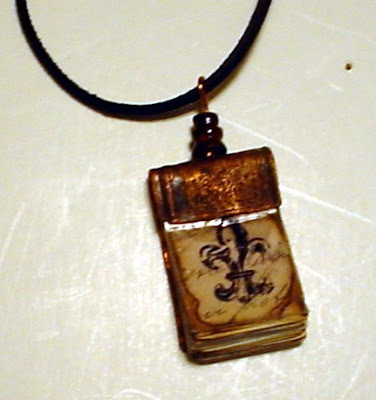 A book pendant I made with etched copper metal, with a stamped mica cover and hangs from a leather cord. Captured Heart. A altered metal tin shrine I made. 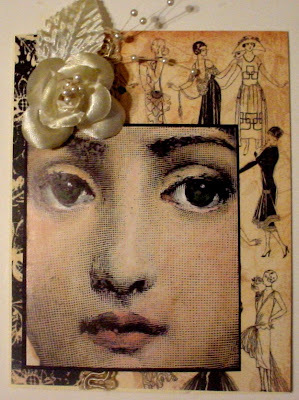 Paris, A mini altered canvas that hangs from a vintage jewelry piece. Best of luck. Thanks for stopping by! See Lisa's blog for even more information. This month we have a wonderful sponsor. 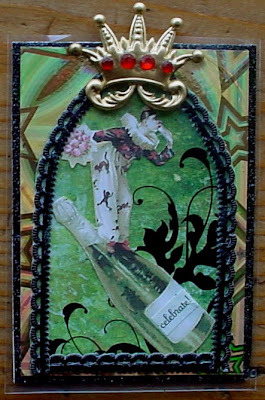 Jennie from Artistic Stamper based in the U.K. She provided the beautiful stamps I used in this piece. 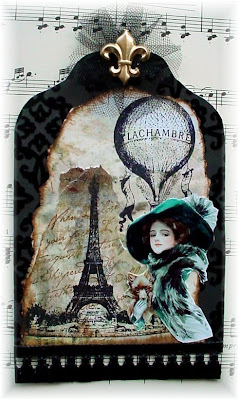 When I think of lace I think of Victorian elegance and whats more elegant than a vintage glove? 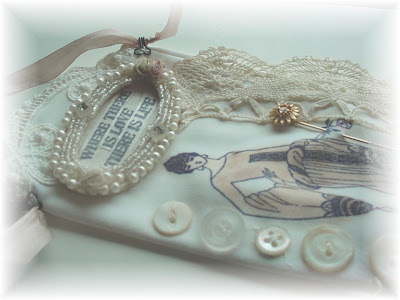 I did a transfer of the wonderful stamped woman on a piece of Sheer Heaven then chalked it before transferring it to the glove, added buttons, a bit of vintage lace and stamped the text inside the vintage bead work piece,added satin flower and tulle. A hat pin and some text finish it off. 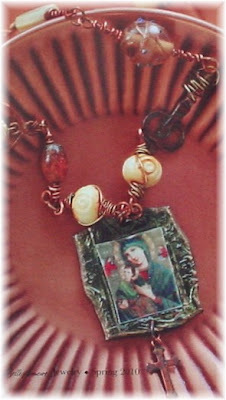 It hangs from a silk ribbon. 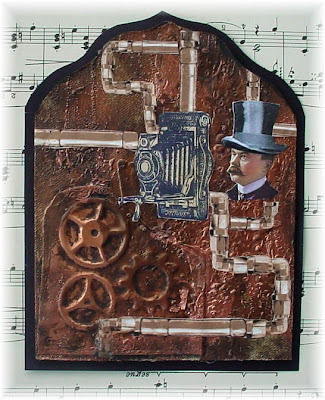 Watch for more wonderful art all month on the Gingersnap Creations blog and here too. turn to do a project, and what a project she did!!! She came up with the most amazing idea. 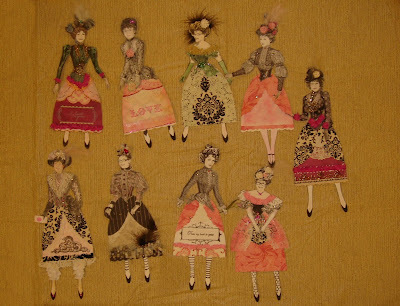 She spent hours on her computer making these dolls, in each of our images. 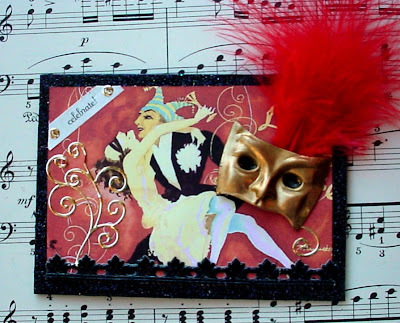 We cut them out of card stock and decorated each one to suit us. So now I have my very own "Lynn" Paper doll. So can you pick mine out yet? Hint.. I'm wearing pantaloons! LOL, she also sent me a picture of me with my doll, but honestly I need a new doo, so sorry gals no photo tonight. Be on the watch for Inka to make these available to the public on Etsy soon, YES you too can have your very own paper doll in your likeness!!!. 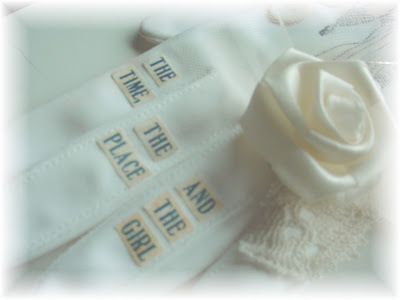 Wouldn't these just be adorable as a Bride and Groom set for a wedding celebration? While I have you here a little recap on Saturdays ATC class I taught at Scrapers and Stampers. We had the most wonderful time! But me being the ditz I sometimes am, forgot my camera,but Linda fromStudio L 3 remembered hers and did the most wonderful write up on her site. She is such a delight to be around go take a peek to see how much fun you missed out on! but remember I still needed that new doo! LOL. TJ easy peasy with some Graphic 45 paper background and a silk flower thrown in for good measure. Use code SAVE10LYNN at checkout to save 10%!! 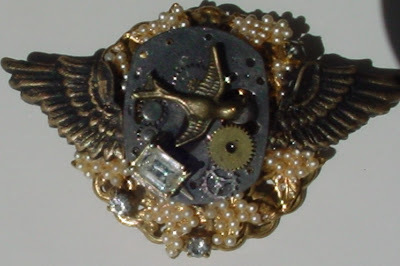 Here's another little teaser for you another Steampunk pin That will be in my Etsy site soon. 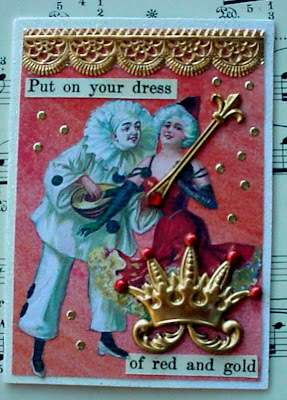 Here's a couple of little Mardi Gras ATC's for an online swap I belong to.